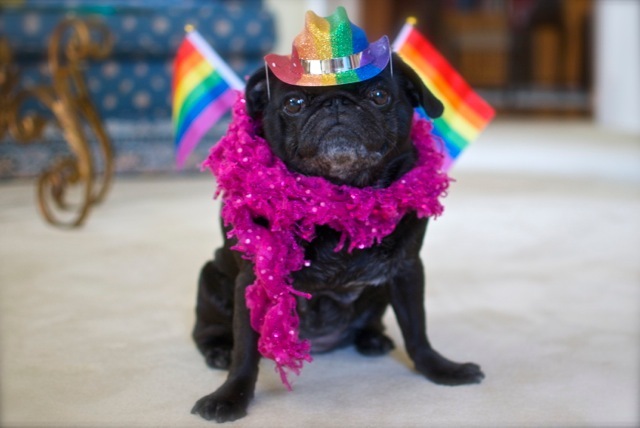 Lola Pug’s hometown has been pretty stoked for some time about hosting 2014 World Pride, and the glorious weekend is finally upon us. The weather has been sunny and hot, which is great for (most of) the humans, but it’s not so great for the four-leggers, so Her Royal Highness has had to miss out on most of the fun. …which probably suits her just fine, really. But we couldn’t miss out on the MOST fun part of Pride, could we? I think she needs her own float. Maybe carried like the Queen that she is in a litter by some gorgeous celebrants…. Pugs are proof that being like everyone else is BOOOORING, so be proud of who you are and go into the world with grace and love, and grace and love will find you right back. Love, Peace and HAPPY PRIDE to everyone in our city and around the world. I would carry you around proudly, Lola, but I’m like you sand would prefer staying put and enjoying some good food and drink! Thank you, Gampy! It’s too hot here today to do much more than lie in front of the AC on my special bed, but I’ll be dreaming of you carrying me in the parade today! I’m more IN with the AC, Auntie Lea, but I’m certainly loving the world today! Yay Lola! I am so impressed by your outfit. This weather has not been suiting me either so I totally understand your pain. Oh, Bunk, it’s either too cold or too hot. Why can’t we all live on Planet Pug, where it’s perfect all the time? Oh my gosh Lola, you look amaaazing!! 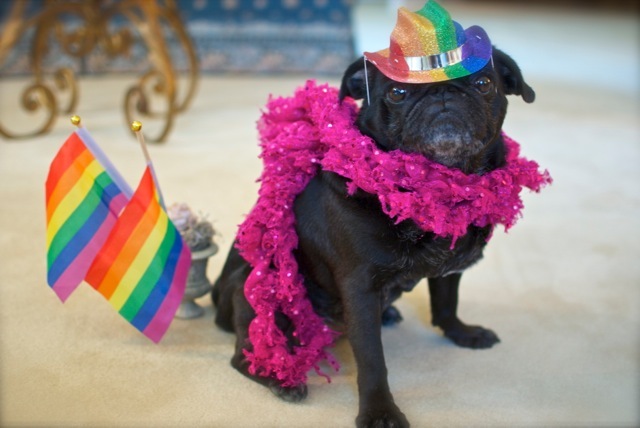 and I love the message you are sending out, they should have had you as a Pride mascot for sure! Thanks, Carrie! The world really would be so much better if pups were in charge, no? We love ALL colours of the rainbow!